Among the most memorable are the Players function at the Cartier Polo day at Windsor, Roger has also worked alongside Tony Blackburn at the Reebok Stadium & Corn Exchange, with Lenny Henry at the ICC, by Wax also at the ICC, Sheila Ferguson at ExCel, Paul Ross and the wonderful Peter Kay at the Birmingham Metropole - amazing nights! Other clients include KPMG, RBS, HSBC, Hewlett Packard, Buena Vista Home Entertainment, Paramount, British Telecom, O2, PC World, HMV, HBOS,Vodafone. 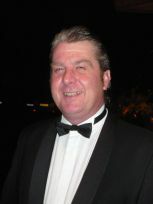 Roger will also act as a host/compare for the evening...and yes he is fantastic at it! !